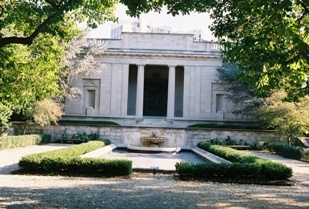 The Rodin Museum contains the largest collection of sculptor Auguste Rodin's works outside Paris. 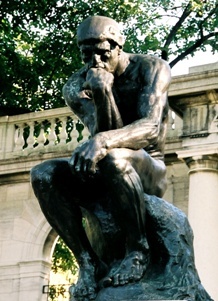 The best-known of Rodin's works, The Thinker (1880-1882), sits outside the museum in the entry courtyard.
" It would be impossible to overstate the significance of Auguste Rodin (1840-1917) to the history of art. More than any other sculptor since Michelangelo, Rodin changed the face of figurative sculpture and ushered in a whole new era of artistic expression. Many know Rodin for his famous controversies—the scandal around the Age of Bronze or the Monument to Honoré de Balzac—or for his unfinished projects, most famously The Gates of Hell. But few who recognize Rodin’s works have failed to be moved by them. The innovations he introduced into sculpture were elaborated by countless artists who followed him, including many who worked in his studio, such as Constantin Brancusi and Aristide Maillol." The Museum was the gift of movie-theater magnate Jules Mastbaum (1872-1926) to the city of Philadelphia. Mastbaum began collecting works by Rodin in 1923 with the intent of founding a museum to enrich the lives of his fellow citizens. Within just three years, he had assembled the largest collection of Rodin’s works outside Paris, including bronze castings, plaster studies, drawings, prints, letters, and books.